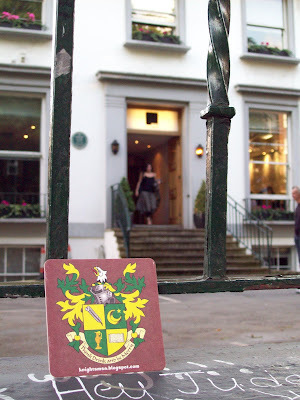 It's been just a few weeks since the House of Warrick and the House of Greenbriar Knights met up with Sir Dayvd in London, pub hopped, and walked the night away. 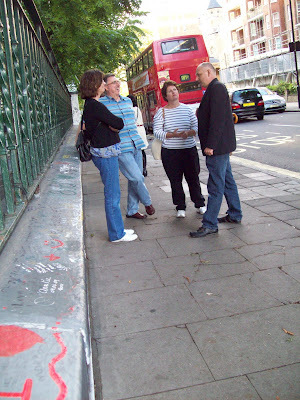 One famous walk was, of course, across Abbey Road. It's amazing how we can all COME TOGETHER in such a moment. It was really SOMETHING. I don't know if you can tell from the photograph, but there is a lot of construction going on around the famous studio. It was if we were listening to the sound of MAXWELL'S SILVER HAMMER renovating buildings. OH, DARLING what an experience to be standing at the famous studios and having our photograph made walking the famous zebra crossing. We did experience a little problem with traffic coming from all directions like an OCTOPUS'S GARDEN; hurried drivers daring us to jump out in front of them, there eyes screaming "Go ahead. I WANT YOU on my bumper!" I wish we could have stayed there all night and into the morning and watched the sunrise, "Look, HERE COMES THE SUN!" We would have been SUN KINGS! But, we had to eventually go BECAUSE it had been minutes since we last visited a proper pub and bought Sir Dayvd ales. Sir Hook teased Sir Dayvd, "YOU NEVER GIVE ME YOUR MONEY!" as he bought the round. And dinner? The sausage served for dinner was awesome -- especially with the MEAN MR. MUSTARD spread. Our waitress was polite and hard working; POLYTHENE PAM was her name. At one point she did sneak out for a cig and the owner locked her out for fun, but SHE CAME IN THROUGH THE BATHROOM WINDOW and continued to serve us pints. Before long, we had to CARRY THAT WEIGHT of pints and potatoes, sausage and beef pies back to the hotel for some GOLDEN SLUMBERS. THE END of an enchanting night. Thank you to Sir Dayvd and HER MAJESTY for a lovely trip. According to one news article, The Beatles record label said it wouldn't sell because it did not feature the names of the band or the LP. But 40 years on and 12million sales later, the most famous album cover of all time has been copied all over the world. 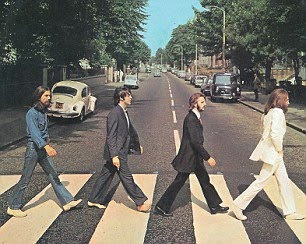 Dozens of bands - ranging from Booker T & The MGs to the puppet characters from TVs Sesame Street - have recreated their own versions of John, Paul, George and Ringo striding across the zebra crossing outside the Abbey Road studios on August 8, 1969. It was funny to see the Bob and Tom cover -- they're radio jocks / comedy team out of Indianapolis, Indiana. Their show has aired in Evansville for 20 years. Here are 40 copies of the Fab Four. 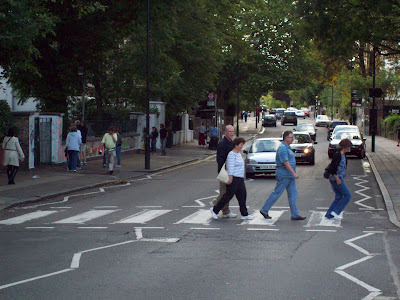 I like the fact that Lady Allwinky has a spring in her step as she crosses famous Abbey Road study walk-way......perhaps she couldn't wait to get to the studio?.....perhaps she couldn't wait to get to.....the louve!!! Enjoyed all the pics of your journey to our Motherland.....of course.....mine is across the channel in Ireland!! Sir Richard....King for a day of Coffee Crossing.....pass the coffee cake please! What an awesome experience it was! And, by the way the 40th anniversary of taking the famous picture was last Saturday. I liked how you worked in all the Beatles songs into the story. Even better that it was "mostly" accurate, except for the bathroom window. But, then again, I might have been too busy taking pictures of the loo while she came back in! Remember...Happiness is a Warm Gun! Darn it Bowie theres not quite enough of you to photo-shop you back in line... lol...i could have then dragged you all back toward the middle. Actually, I believe I was in line -- it was the other three who were out of step. Warm gun; warm beer -- NO ALCOHOL allowed on the firing range (at least north of The Mason-Dixon Line).